The following are a few of the things that some of our guests and other independent reviewers have said about our inn. We hope these give you a good idea of the experience we strive to always offer at Oceanside Meadows. Description from: Fodor’s New England’s Best Bed & Breakfasts 4th Edition. Down East section by Hilary Nangle. “Oceanside Meadows: Along the sleepy road to Corea, nearby where author Louise Dickinson Rich made her home, is a magnificent sand beach set off by dunes. If it catches your attention, you’ll likely miss the rambling white-clapboard farmhouses that compose Oceanside Meadows on the other side of the road. Owner Sonja Sundaram, a geologist-geographer with a teaching background, met her husband, Ben a marine biologist who hails from Scotland, at an environmental studies program in Bermuda. Together they have extensively renovated the original house, built by Captain George Allen in 1860, and taken over the Sands, the 1820 inn next door. They are well on their way to their goal of building an environmental education center on the property. We have dunes, beach, forest, ponds, a salt marsh, and tidal pools,” Ben says, adding there are six bald eagle nesting sites on the nearly 200-acre property. Rooms are comfortably furnished with country furniture as well as ornately carved mahogany pieces that Sonja brought back from her travels to India. Both houses have comfortable living rooms, the Sands has a full kitchen for guests’ use as well as a music room with a piano. You can see the water from rooms in the front of both houses. Room 5 in the main house, built into the eaves and decorated in pink and blue, has an excellent view of the beach. In the Sands, Room 1 has a private deck over-looking the water, a cathedral ceiling, and a magnificent chest from India that was hand-carved an inlaid with ivory; Room 5 has the best view of the bay; and Room 7, built under the eaves on the third floor , is popular with honeymooners. The elegant multi-course breakfast includes such dishes as chilled mango-lime soup and waffles with gorged pears; all use fresh herbs and edible flowers from the inn’s organic gardens. After eating, you can go moose spotting on the nature trails to the marsh, walk along the shoreline to a lighthouse, or just sit on the beach and listen to the waves.” End of description in Fodor’s guide to New England’s Best Bed and Breakfasts. Oceanside Meadows: Inspired by the ocean out the front door; fields, woods, and a salt marsh out back; and moose, eagles and other wildlife, the owners have created an environmental center here with lectures, musical performances, and other events held weekly in the barn. This guide also described “The Schoodic section of Acadia National Park (five minutes from Oceanside Meadows Inn)… At the tip of the point, you’ll get a sense of how unforgiving the sea can be: Huge slabs of pink granite lie jumbled along the shore, thrashed unmercifully by the crashing surf, and jack pines cling to life amid the rocks. The Fraser Point Day-Use Area at the beginning of the loop is an ideal place for a picnic. Work off your lunch with a hike up Schoodic Head for panoramic views up and down the coast” End of description in Fodors’s 2000 guide to Maine, Vermont and New Hampshire. Description from: Maine an Explorer’s Guide 9th Edition by Christina Tree and Elizabeth Roundy “The most encyclopedic and useful guide to the state” Travel and Leisure. 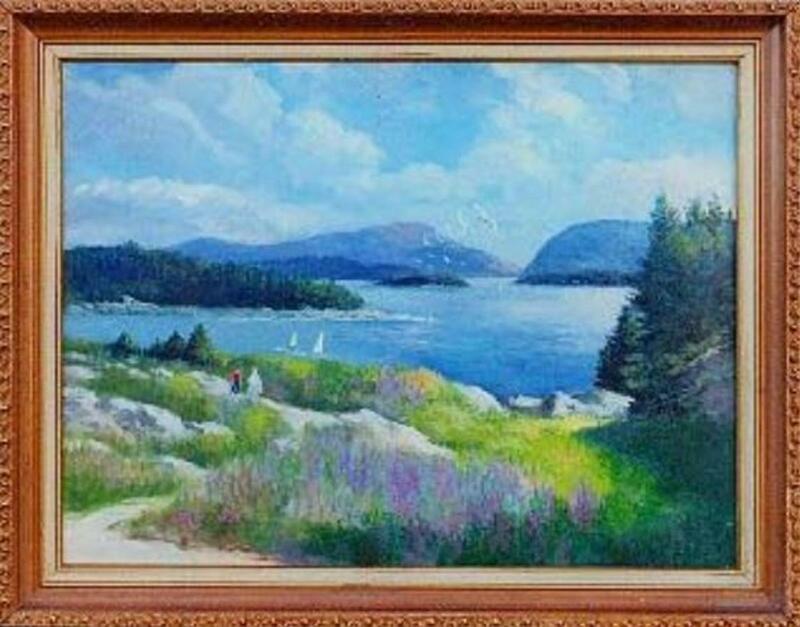 “Oceanside Meadows Inn: This 200 acre property/nature preserve includes an 1860′s sea captain’s home and neighboring 1830 farmhouse overlooking well-named Sand Cove. 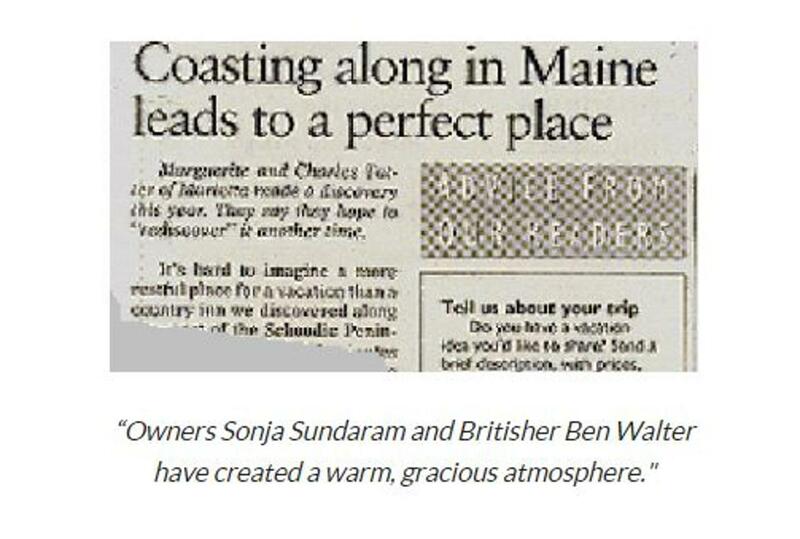 Sonja Sundaram and Ben Walter (who met at an environmental study center in Bermuda) have spiffed up the guest rooms (there are seven in each building, including seven suites suited to small families) and gracious common rooms. The farmhouse, in particular, lends itself to rental as a whole, ideal for family reunions. The meadows and woods are webbed with trails leading to a salt marsh and a rehabbed open-timbered barn used as a theater, conference or wedding reception center”………. Article from New York Times Travel Section, Titled “Way Down East” by Pamela J. Petro. “At night, the quiet sounds of surrounding meadows and a nearby salt marsh, punctuated by the sound of gentle waves crashing on the beach, are certain to lull you to sleep.” End of Article copied from: The Atlanta Journal/ The Atlanta Constitution, Sunday edition. Notes from the renowned guide “The Coast of Maine”, by Rick Ackermann and Kathryn Buxton. Overlooking the Gouldsboro Peninsula’s only sandy saltwater beach, Oceanside Meadows Inn, is a jewel of a place on 200 acres with fabulous gardens and wildlife habitat. The elegant 1860′s main house has seven attractive rooms; next door are three suites (now seven bedrooms with all private baths) in a recently renovated 1830′s farmhouse. Breakfast is an event, staged by innkeepers Sonja Sundaram and Ben Walter.